Cookie Clicker is a popular browser game that is fun for all the family, where players must click a cookie to produce more cookies. Expert players have produced over a billion cookies from their clicks alone. There is a darker side to Cookie Clicker though: it is very likely that it is in fact designed to turn people against the cookie industry. On the face of it, Cookie Clicker is a sweet, innocent game. After all, cookies encapsulate the best in all of us and are completely wholesome. Why then does the game contain satanic imagery, such as portals to hell and grannies that turn into devil monsters to bring about the apocalypse. 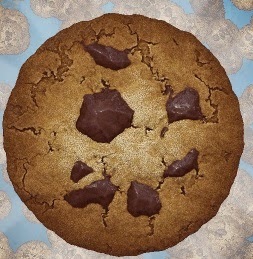 The game constantly relates the acquisition of cookies to ideas such as slavery and dark sciences, at one point letting the player collect cookies from hell itself as the giant cookie the player must click swims in a lake of blood. This negative imagery subtly reinforces the idea that cookies are evil. Any player who feels tempted to snack on a delicious cookie will instantly be subjected to hellish images the moment their hands touch a cookie. And of course, we know that familiarity breeds contempt: in providing the player with literally billions of cookies it is unlikely that would ever want to eat a cookie again. We do not know much about the shadowy game developer or their motivations for this, but tantalising clues are available. The game concentrates on the use of grannies to bake cookies. Most people know that cookies are created by mothers, not grannies, so why this change? It is very possible that the game developer is a granny, bitter at their advanced age and loss of teeth that prevents them from eating cookies and so has pledged to ruin the experience for everyone else. Think of the key game mechanic of this game: clicking. Repetitive motion is a good way to get Carpal Tunnel Syndrome. Could this game developer granny with a hatred for cookies have devised a way for the youth of today to give themselves Carpal Tunnel Syndrome and so make their hands as withered and gnarled as her own? Whilst there have been no reports of this game causing this syndrome it can only be a matter of time, much like governments of the world have woken up to the incredibly violent and corrupting game that is Minecraft. The game developer has reported that they will be adding dungeons to the game in order to imprison players. We can only sit and wait in dread at the effect this will have.